SIZE 14" x 23 3/4"
The Fillmore crowd loved his act, and Howlin' Wolf was back the next weekend for his second show. Wilson's artwork doesn't have much to do with the music, but certainly draws attention to the poster. The poster/postcard bundle contains a 1st printing poster and postcard. Our poster bundle collection is the world's best, encompassing vintage and contemporary posters from the 1960s to today. Our vast poster collection features classic bands in rock, blues, jazz, soul, and more. We also have thousands of movie, dance, political, sports and theater posters. When the Avalon Ballroom and Bill Graham's Fillmore Auditorium began to hold weekly dance concerts, Wilson was called upon to design the posters. He created psychedelic posters from February 1966 to May 1967, when disputes over money severed his connection with Graham. 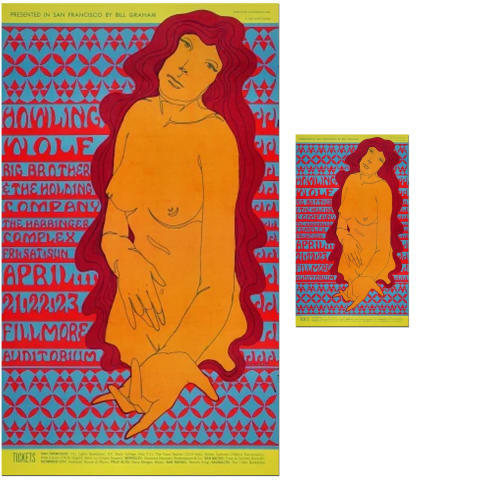 Wilson pioneered the psychedelic rock poster. Intended for a particular audience, "one that was tuned in to the psychedelic experience," his art, and especially the exaggerated freehand lettering, emerged from Wilson's own involvement with that experience and the psychedelic art of light shows.